Sysessential for MSG to VCF Converter is a well-known email conversion application with ability to convert MSG files into vCard VCF files. The move of the data clearly implies conversion of entire information from end to the other in the systematic manner. Software is the provider of all the details from MSG Outlook files into VCF file format of vCard. It supports for converting data of ANSI as well as Unicode formatted Outlook addresses. Software is supportive of creating separate VCF file for saving all the contacts from MSG file into VCF file format. This resolves the matter like mixing up all the contacts. You can save the file separately with a unique file name. This helps you opening the file separately with no confusions at all. Sysessential for MSG to VCF Converter is supportive of all the MS Outlook versions such as Outlook 2016,, 2013, 2002, 2010, 97, 2007, 98, 2000, 2011, etc. Software supports for converting all the crucial contacts details into vCard with info such as address, name, website, contact number, activities, etc. Details will remain safe during conversion and there will be no chances like data loss. Software implements ultra easy to operate steps. The step by step process is understandable and comfortable in the long run. Users will less technical skills won’t feel discomfort with the procedure and able to understand all the steps in clear terms. If you have come across urgent need of converting MSG files into VCF then give a phone call at Syseseential premises and get the software via online mode. Call anytime and clear out all the concerns and then look for easy buying options from customer care team. The application is compatible to work with all the MS Windows versions such as Windows 10, Win 7, and lots of other editions. Sysessential for MSG to VCF Converter is the product that hardly worries for file size limit. It is supportive of converting large sized MSG files into VCF file format. After moving data into VCF, you can further import data into I-phone, Microsoft® Outlook, IMB Lotus Notes, Gmail, Apple mail etc. The application runs on Windows editions only. You can install the application into any of the Windows editions and this will resolve all sorts of complications soon. What about file saving options in the software? There are two file saving options one you can save in existing VCF file or else can create a new file and save data into it. It is up to you, how you are comfortable to save the files. Explain two conversion options in Sysessential for MSG to VCF Converter? Software gives option to convert single MSG file into VCF and another one is conversion of emails in batch. You can migrate batch MSG files into vCard. What are the prerequisites for running Sysessential for MSG to VCF Converter? The tool runs on Windows OS editions in comfort zone. The installation of MS Outlook is another mandatory requirement for fetching up to the mark results. How email migration is performed? Email conversion is executed is easiest and refined manner. 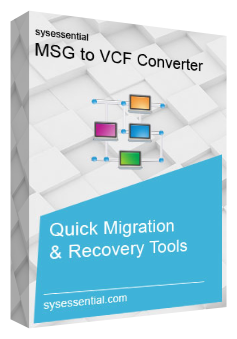 There is involvement of only few steps that lead to migrate all Outlook MSG files into .vcf file format. Are software features easy to understand? The features of the application are quite simple and this leads to perform migration of MSG files into vCard later you can access contacts into other applications. How to collect product key after buying the software? In this regard, customer care team offers immediate help and guidance to you. Just give them a phone call and they will let you know how to avail the application completely. Software purchase is worthless until and unless you avail product key. Thus making a phone call at the helpdesk is all you needed. I was looking for some easy alternative to convert MSG files into VCF file format. After going through demo run of applications, I finalized for Sysessential for MSG to VCF Converter. I watched the process of converting first 10 emails of MSG files into VCF and this has made clear all the things. The sophisticated set of features and easy working process clarified everything in advance and made me comfortable to work with the application. You can also go for this facility and seek the best results like me. I am amazed to possess Sysessential for MSG to VCF Converter in licensed version. It has excellent qualities to convert MSG files into vCard VCF files. After fetching the application, I am now able to use the software whenever I feel the need. The conversion process is so quick that I am mesmerized with the way it handle conversion process. You can also give a try, believe me best results.